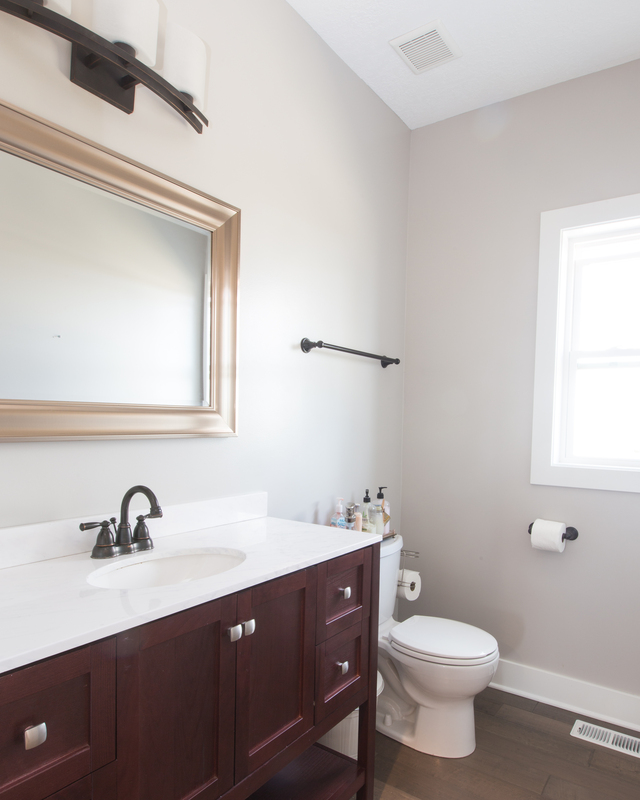 Remodeling your bathroom is one of the smartest home remodeling projects you can choose to have completed. When executed well, a combination of form, functionality and aesthetics can recoup you around 60% of your investment in resale value! Whether you have a simple powder room or a master en suite, functionality should be at the heart of your bathroom remodel. In the photo on top, this farmhouse half bath was given dark hardwood floors to match the rest of the house. The vanity provides plenty of storage and the white top with white trim helps to give the room a large and bright feel. The bronze hardware gives a visual pop making this bathroom pleasant on the eyes. 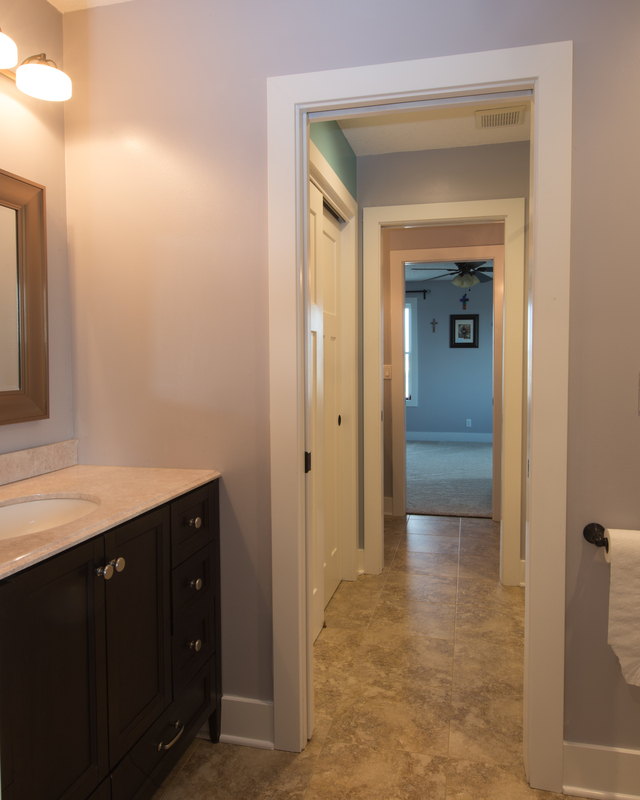 The above photo shows a great Jack and Jill bathroom. This style of bathroom is great for multiple kids sharing 2 bedrooms. This particular design gives each bedroom a private toilet and sink while having a shared tub/shower and linen closet. The grouted LVT floor gives a great tile look and should hold up to the use that the children will give it. The photo that follows shows an incredible master bathroom shower we built. This client wasn’t happy with the amount of space their corner shower provided. This couple wanted to be able to shower together comfortably. After reviewing the space, we developed a plan to eliminate the linen closet since the amount of vanity they had combined with a sizable walk in closet would provide the amount of storage they needed. After removing the closet, the front wall was extended and gracefully curved as to not hinder the walkway into the bathroom. The area where the closet originally was, became the entrance to the shower and eliminated the need for a shower door or curtain. Duel shower valves where installed at the entrance allowing independent control over temperature. Mosaic tile was used to allow us to follow the curves of the walls and slope of the floor. This shower boasts plenty of storage for one niche as two windows high on the wall. 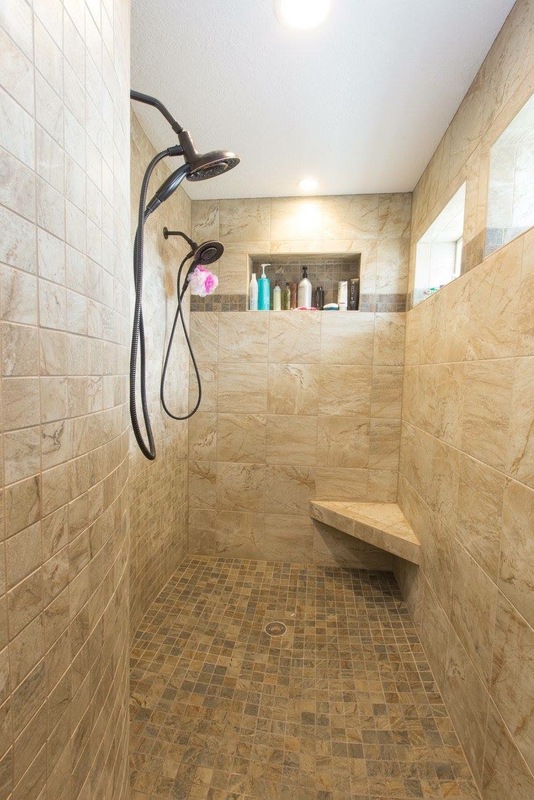 This is one shower you may not want to leave. When your ready to update your bathroom to the space of your dreams let Compassion Builders be your contractor of choice!